Our range of catering trolleys are designed to support you with refreshments in the office. Mobile catering trolleys with castors provide manoeuvrability, allowing you the freedom to serve cold and hot drinks, food and snacks anywhere in the office. Whether you have an onsite catering team, managed facilities or provide catering in-house, our range of contemporary catering trolleys will put you in the best position to serve your employees. After all, who wants to struggle with a tray full of hot drinks when you could have catering equipment that allows you to provide a service to employees safely and efficiently? For example, Green High-End Catering Trolleys, designed by Giandomenico Belotti, suit both residential and hospitality catering applications. Green Folding Outdoor Trolley features a structure in anthracite stove enamelled steel with galvanic treatment and white nylon wheels with black polyurethane edge; stove enamelled perforated steel tops with galvanic treatment. Cargo Catering Trolleys can function in both the home and in the workplace. They can be used for serving refreshments or food at parties or in more formal meeting room environments. Characterised by classic simple features such as the wheels and the leather-bound handle in any of the versions from the Cargo Catering Trolleys Collection will elegantly complement the rest of the furniture in any space. The Tidy Trolley has an upper surface made from tempered glass, an upper storage compartment for trays and cups made from tempered glass and closed with a flipper door, two drawers with metal runners and handles and a removable lower compartment designed for waste bins. 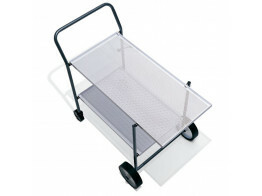 Stylish and versatile, Tidy Catering Trolleys feature a rounded and soft design. 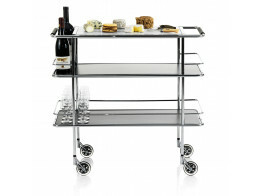 Contemporary catering trolleys from Après Furniture. 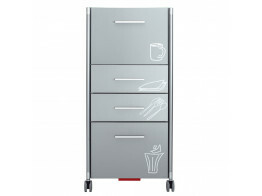 Tidy Trolley is designed for coffee service and catering support within breakout areas. Green Folding Outdoor Trolley suits high end residential and hospitality catering applications. Cargo Trolley Collection: Cargo Trolley, Cargo Support Trolley and Cargo Gastro Trolley.